At its winter Board meetings in Rome later this month, the University of Notre Dame will confer honorary degrees on leaders of ecumenical dialogue and engagement of the laity. 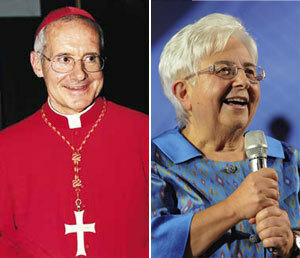 Cardinal Jean-Louis Tauran, president of the Pontifical Council for Interreligious Dialogue, and Maria Voce, president of the Focolare Movement and the only woman to lead a major lay movement within the Catholic Church, will receive honorary doctor of laws degrees during an academic convocation Jan. 27 (Monday) at Notre Dame’s new center in Rome’s San Giovanni neighborhood. “Through their energy and good works, our honorees personify the fact that God’s love knows no barriers,” said Rev. John I. Jenkins, C.S.C., the University’s president. Cardinal Tauran will address the convocation on the importance of interreligious dialogue and the manner in which Catholic universities should contribute to discourse between communities of faith. During their week in Rome, Father Jenkins and other University officials will meet with Vatican leaders in papal congregational offices and pontifical councils related to Notre Dame’s mission as a leader in Catholic higher education. The Board of Trustees also will conduct its regular business meetings about nine months after the election in March of Pope Francis and a month after Time magazine named him its Person of the Year. Coincidentally, the board’s last meeting in Rome was in 2006, also taking place nine months after the election of a new pontiff, Pope Benedict XVI. The new Notre Dame Global Gateway in Rome is a completely renovated 32,000-square-foot building located just a block from the Colosseum. The facility serves as the home to study abroad programs for the School of Architecture and the College of Arts and Letters. Anchored by the recently completed Rome Center at Via Ostilia 15, this Global Gateway will serve as the focal point for the University’s academic and cultural endeavors in Rome and, in conjunction with Notre Dame’s Global Gateways in London and Dublin, throughout Europe. A native of Bordeaux, France, Cardinal Tauran was ordained to the priesthood in 1969. He worked as a priest of the Archdiocese of Bordeaux before entering the Vatican’s diplomatic service in 1975 and serving in the nunciatures, or Vatican embassies, of the Dominican Republic and Lebanon. In 1983 he was appointed to the Council for the Public Affairs of the Church, served in Vatican missions to Haiti, Beirut and Damascus, and was a Vatican delegate to several international conferences on security, disarmament and cultural relations. He was elevated to cardinal by Pope John Paul II in 2003. Cardinal Tauran, who speaks French, English, Spanish and Italian, is an active member of several institutions of Vatican governance including the Congregation for the Doctrine of the Faith, the Congregation for Bishops, the Pontifical Council for Promoting Christian Unity, the Apostolic Signatura and the Pontifical Council for Culture. He was appointed by Pope Benedict XVI as president of the Pontifical Council for Interreligious Dialogue in 2007. Cardinal Tauran voted in the 2005 papal conclave that elected Pope Benedict and the 2013 conclave that elected Pope Francis. On March 13 of last year, it was Cardinal Tauran who formally announced the election of Pope Francis to the crowds in St. Peter’s Square and to the world using the traditional “Habemus Papam” formula. A columnist for the official Vatican newspaper, L’Osservatore Romano, recently called Voce “the most eminent woman in the Catholic world.” She has been part of Focolare since 1963, living in the movement’s centers in Italy and Turkey and working in the founder’s personal secretariat. She led the updating of Focolare’s general statutes between 2002 and 2007 and is a consultor for the Pontifical Councils for the Laity and for Promoting the New Evangelization. As a legal expert, she is a member of the Abba School, a Focolare center for interdisciplinary studies, and co-leader of Communion and Law, a network of academics and professionals involved in law. The first woman to practice law in Rome’s modern judicial system, Voce received a degree in civil law from Sapienza University of Rome, as well as degrees in theology and canon law. Originally published by Brendan O’Shaugnessy and Michael O. Garvey at news.nd.edu on January 20, 2014.